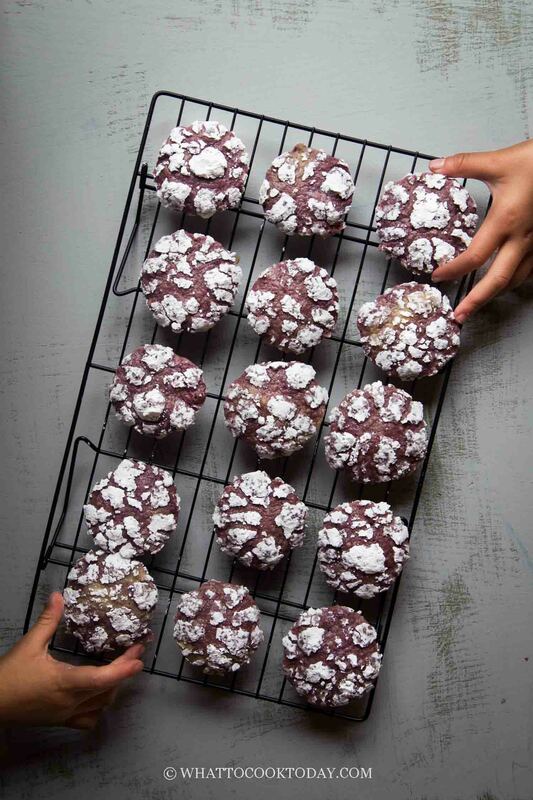 Amazingly soft and gooey crinkle cookies with a hint of ube or purple sweet potatoes are HUGE hit in our house. It’s hard to stay away from them. 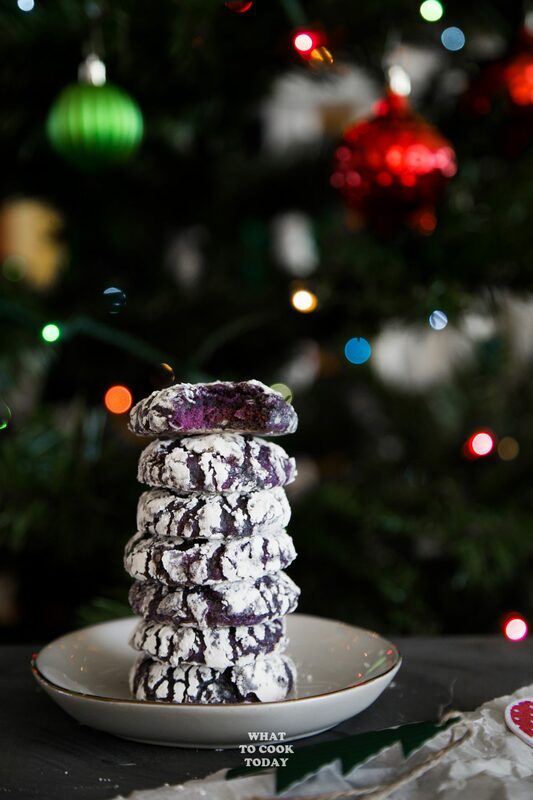 These amazingly soft ube or purple sweet potato crinkle cookies have become one of our family favorites every year. I like the crusty cookies on the outside but the inside is soooo soft, gooey and just melt in your mouth!! It has that hint of purple sweet potato that I love. Even if you don’t think you will like purple sweet potato or ube, you will not mind it in these cookies. For Real! You can read about the different purple sweet potatoes and ube in this purple sweet potato chiffon cake. If you can’t find fresh ube (I couldn’t), you can get the frozen grated ube and then steam it and mash. Another option is to use ube jam (ube halaya). This is usually has been sweetened, so you may need to cut down on the amount of sugar. I have yet to try it with ube jam. -The color of the dough remains very light purple after beating with butter and adding regular baking powder or aluminum-free baking powder. So, you can use either baking powder, that doesn’t cause the color change in this case. -The color change to light brown after adding an egg. This is probably due to the purple and yellow from the yolk forming that light brown color. -The color of the dough remains purple after beating with butter and adding regular baking powder or aluminum-free baking powder. You can use either baking powder, that doesn’t cause the color change in this case. -The color of the dough change to light brown to after adding an egg. The dough simply doesn’t change color even after adding an egg or after baking. This is the purple sweet potato I highly recommend to use in baking. They turn slightly darker after baking, but purple color is still vibrant. 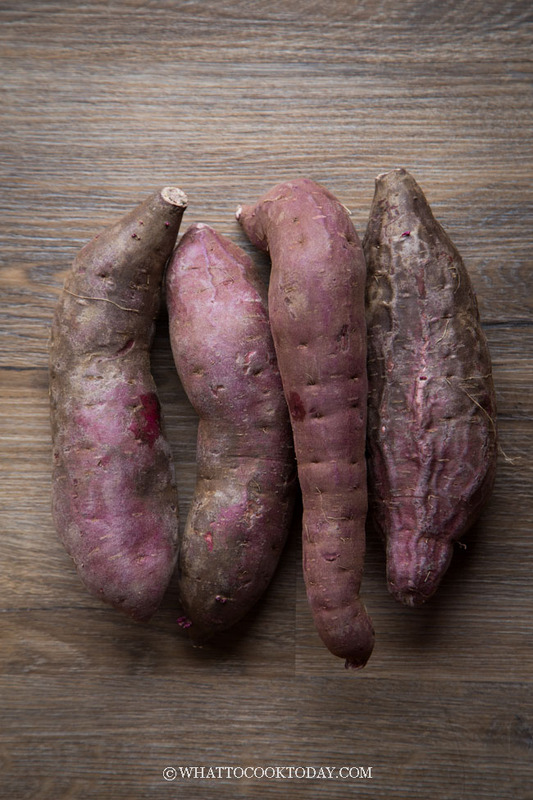 In the U.S. here known as Stokes purple sweet potatoes. Stokes Purple Sweet Potatoes. They have brownish purple skin. I recommend using these. 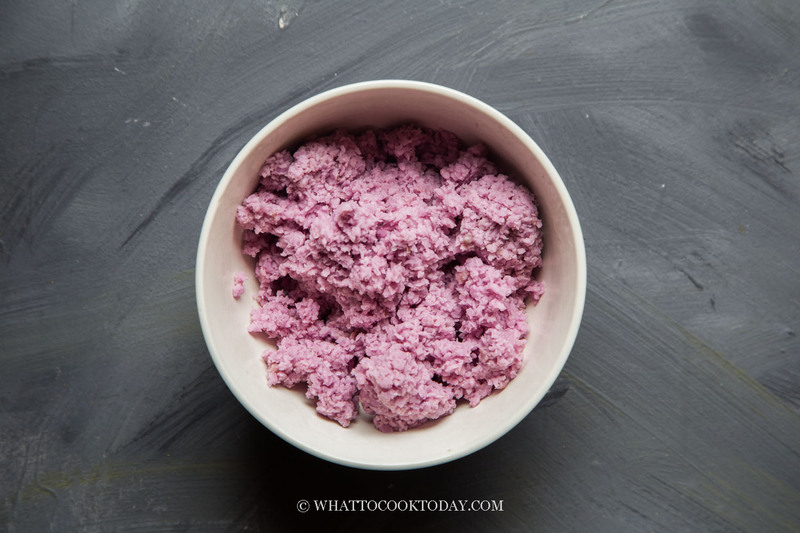 If you use ube or Okinawan purple sweet potato for this recipe, you will need to add food coloring or ube extract. With ube, which the color of the purple is s much more subtle and weaker IMO, it’s hard for the natural color to shine through. SOOOO, I added food coloring for a consistent result. I know it’s not an ideal solution, considering some people, including myself, trying to stay away from artificial coloring as much I can, but if you want to consistently get nice purple color cookies, food coloring will come in handy. There are too many variables or unknown to me and I wish I’m a chemist to be able to tell you what could have gone wrong or didn’t happen! 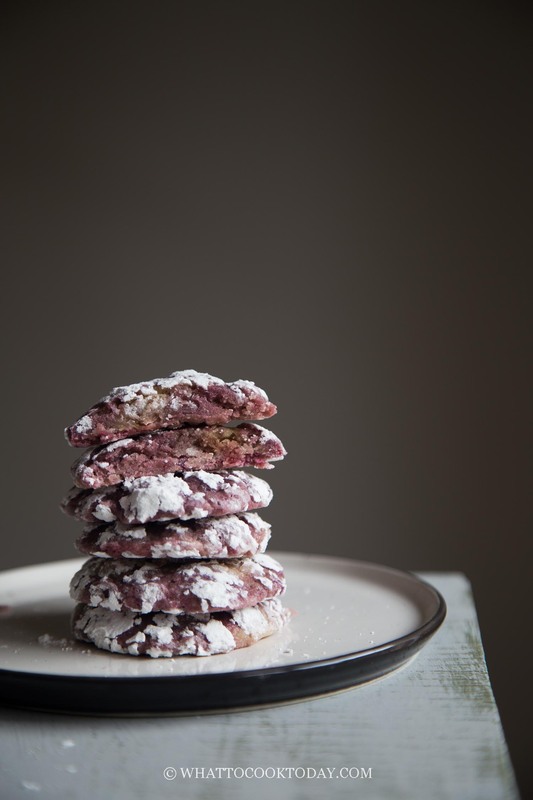 I’ve read other recipes and wondering how they can get the color to be consistent and all of the recipes that I’ve seen, calls for use of ube extract, which will deepen the purple color of the cookies. I don’t have ube extract, and so I use mixture of blue and red to make the purple color. You don’t need additional food coloring. The natural coloring is deep enough and your cookies will not change color. They may turn slightly darker after baked, but the inside will have nice purple color. The cookies have that light taste of ube or purple sweet potatoes in it, which is really nice! Kids really are digging these cookies. I have to actually hide these cookies away from them LOL! 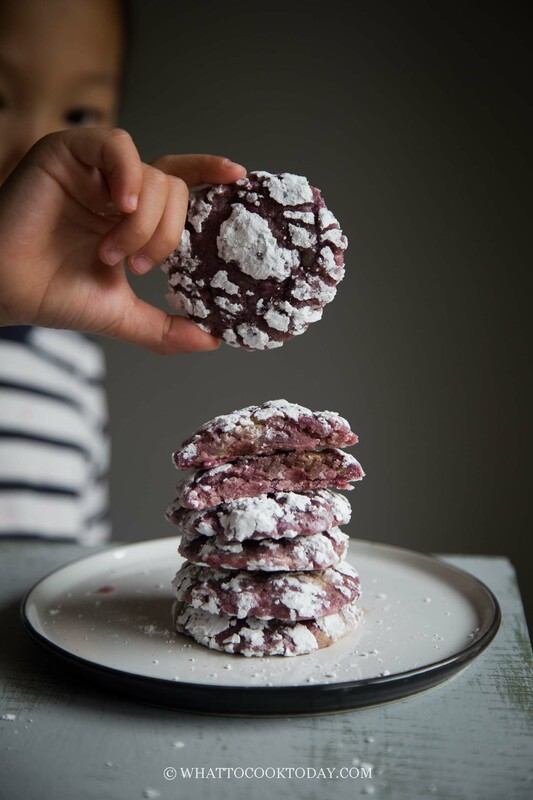 Now let’s go straight to how to make these purple crinkle cookies, shall we? 1. STORE FRESHLY BAKED COOKIES: Let them cool down completely.Store them in an air-tight container (make sure it’s really air-tight) or zipper lock bag with a piece of bread, no more than half size of the bread, at room temperature for 3-4 days. This will help to keep the cookies fresh longer. For longer storage, I would suggest placing them in a freezer bag and freeze them. They can be kept up to 6 months. They can be re-crisped in the oven at 425 F for 4-5 minutes. 2. FREEZE COOKIE DOUGH: You can either roll the dough up into logs or I just roll them into little balls. I place the balls on a baking sheet and then place in the freezer for 30 minutes or so. They will firm up and then I transfer to freezer bag to save space. They can be thawed in the refrigerator overnight, then dip in confectioner sugar and then baked according to recipe. 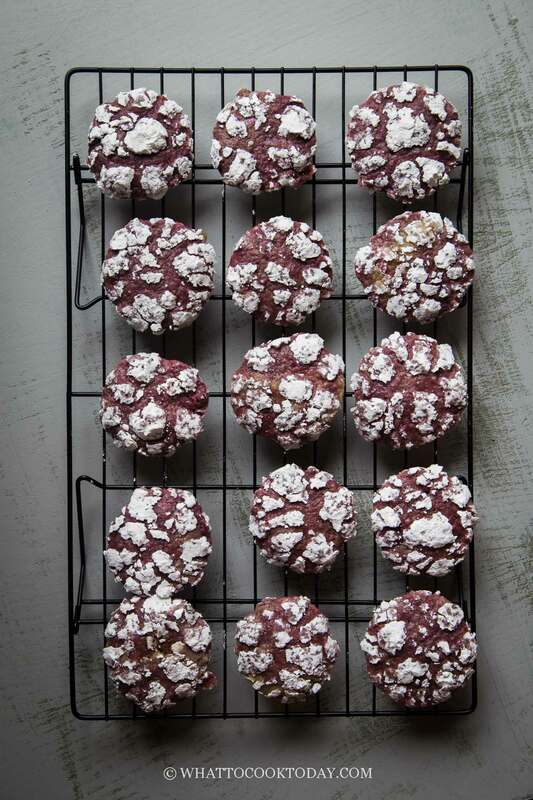 These crinkle cookies are made with purple sweet potato (with brownish purple skin). 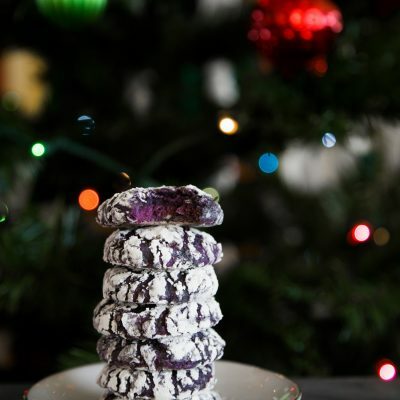 These crinkle cookies are made with ube. 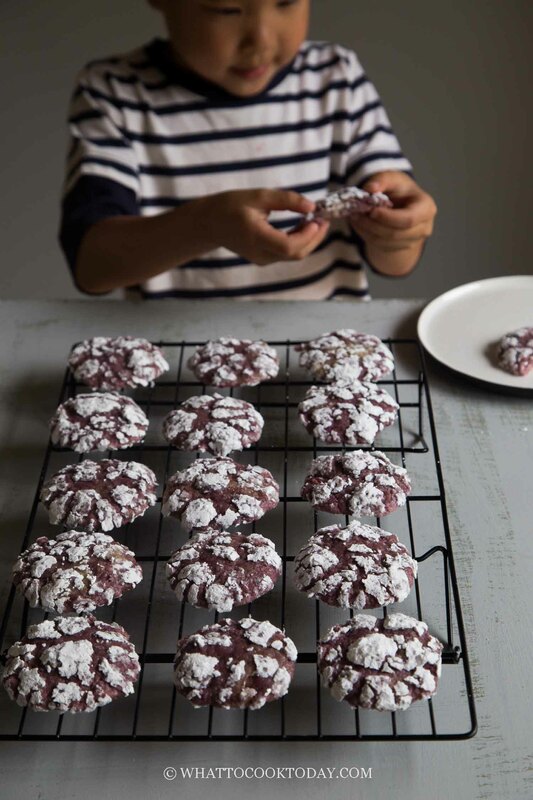 Amazingly soft and gooey crinkle cookies with a hint of ube or purple sweet potatoes is a HUGE hit in our house. It’s hard to stay away from them. If using fresh ube, Okinawan purple sweet potatoes, or Stokes purple sweet potatoes, peel the skin and then cut into large chunks and steam for about 15 minutes or until easily mash with fork. You can also microwave on high for 8-10 minutes or until soft. Turn the speed to low and gradually add in the flour mixture and let it mix until combine. Add food coloring or ube extract (if using) and continue to mix until the color is even and you are happy with the purple color. *If you use frozen purple sweet potato or frozen grated ube, make sure you steam them and mash. The water content will affect the consistency of the dough. *If you use ube jam, you may need to adjust the amount of sugar as usually ube halaya (ube jam) is usually sweetened. Hi! I’m currently making your recipe, and in step 2, you mention vanilla extract, but I don’t see this on the ingredients list. Do you mean baking powder? I forgot the vanilla extract in the ingredient list 🙂 There should be 1/2 tsp of vanilla extract. I’ve added that to the instruction. I’m glad you brought this up. The baking powder is mixed with the flour and salt first. Hope this helps and please let me know if anything is unclear. Hope you like the cookies. can i use ube jam instead? I can’t tell you for sure because I’ve never tried it, but I don’t see why you can’t. You may need to adjust the amount of sugar depending on how sweet the ube jam you are going to use, if it is sweetened. Hi! I made this recipe 2x but the cookies tasted like a soft bread and didn’t really crack. Hmm..I really wish I could tell you what could have gone wrong. I’ve always used this recipe for my crinkle cookies and they always turn out fine for me. The cookies suppose to be soft and gooey. Did you follow the recipe exactly? I tried making this with frozen ube that I purchased from the Filipino grocery & it didn’t turn out as expected. I guess the frozen ube became more watery & made the dough have a sticky wet consistency. Even after refrigerating it overnight, the dough wasn’t as firm as I wanted it to be. The flavor was there but the cookies were not exactly presentable… they were definitely on the flat side. So, lesson learned DO NOT use FROZEN ube. Hi, how do you store your cookies? Refrigerate or leave out? Once the cookies are completely cool down after baking, you can store them in an air-tight container or zipper lock bag and store at room temperature for 3-4 days. I remember grandma likes to put a small piece of bread (no more than half of a slice) in there too. She said it helped to keep the cookies “fresher” . For longer storage, I would suggest freezing them and then you can refresh them in the oven at 425F 4-5 minutes. Hope this helps. Sorry I forgot to include this part. I will add these tips in. Thank you. My cookies came out great except they were completely green in color. They tasted good and even had the white sugar on the outside! (And yes, I used purple ube and followed the recipe). I’m trying to figure out why they turned green. Do you add the egg yolk? Hmm…that is very odd! I’m not sure what to tell you Carrie. Not sure why it could turn out green. My guess it probably caused by the baking powder? Sometimes I heard it can turn food to a different color. I’ve heard people using aluminum-free baking powder for that reason. These turned out great for me! Although, I used packaged mashed purple sweet potato and also ended up with some green-blue speckles in the dough after refrigerating overnight. Didn’t affect the taste at all though! Thank you for trying the cookies out! I’m glad you like them! Now, you are the second one to tell me about this green-blue speckles in the dough. I believe it may have something to do with the baking powder. I didn’t have any on mine, but I have to experiment again. Thanks again for letting me know. 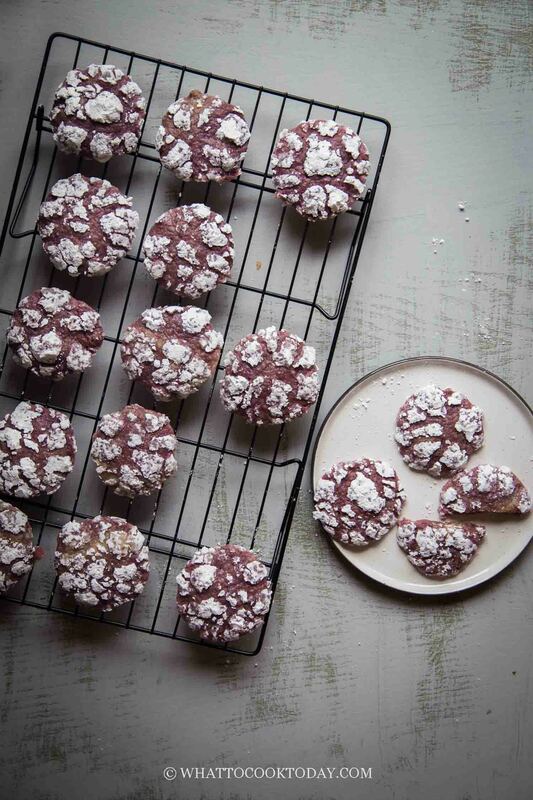 i tried the recipe twice…..with aluminum free baking powder both times, and i am not getting purple cookies…..greenish/brown both times with hints of purplish specks. the yam was really dry, though the butter yam mixture was purple until i added the egg. what am i doing wrong? is the yam not cooked enough? I wish I can give you the answer to why the mixture changes color once the eggs are added 🙁 I’ve been reading a lot about it, but finding no answer either. Did you use grated yam and then steam them and mash? Your instructions say to include light brown sugar, but that is not included in your ingredients list. Can you please advise? Hi Alexis, I’ve updated the recipe few weeks ago not to use light brown sugar. I must have forgotten to take that out from the instruction. It’s only regular white sugar. About the purple sweet potato having greenish blue spots, I think it’s caused by the egg white, not baking powder. I recreated an eatery’s steamed egg over mashed potato dish. In a small mason jar, I put in the mashed organic Stokes purple sweet potato and then put raw organic egg on top and steamed the whole thing. Some areas where the egg white touched the potato turned greenish. Also, I notice the water when boiling the potatoes turn greenish when using tap water. The water turns purple when using alkaline water. Hi Michelle, yes, I noticed that even with regular baking powder or aluminum-free baking powder, it doesn’t make any difference. The acidity and alkalinity sure affect the colors here. Great info! Hello! Thanks for the recipe. This will be the first time I’ll be making these cookies. I bought the frozen grated ube. Should I just thaw before using? Hi Hanna, yes, thaw it and then steam for 10-15 minutes until you can easily mash it. Sorry, I miss the “thaw” part in the instruction. I’ve edited the recipe. I followed the recipe exactly, using purple sweet potatoes. The color is great, but the cookies did not spread at all, barely cracked, and are more cake like. I got exactly 30 cookies so they were portioned correctly. I am wondering, the ingredient list says 1 large egg, but the instructions says eggs and other comments mention eggs. Is there supposed to be another egg? This recipe did not turn out for me. The color was great, as I used purple sweet potatoes, but the cookies did not spread, are more cake like, and are not very sweet. My dough was not as sticky/wet as you described. I weighed all my ingredients and the recipe made 30 small cookies so it made the correct amount of dough. Hi Becky, my apology, there should be another egg yolk added (1 large egg + 1 egg yolk). Somehow when I updated the recipe the egg yolk was left out! The dough should be sticky. If it’s not after adding another egg yolk, it could be that the sweet potato may not have much moisture and you may need to add another yolk. Hi can I add 1 tsp baking soda to the recipe? You think it will taste good ifI add cream cheese? It would be Ube Cream Cheese Crinkles. Thank you!